Love, Me hosts a number of events throughout the year. We list those events here but we also keep our fans updated through our newsletter, facebook page, and our twitter feed. Subscribe. Bookmark. Join us. Bring your fabulous head to this fun DIY get together and craft yourself the fascinator of your dreams. Create a beautiful headband fascinator in time for holiday dress-up and leave with skills to put your crafty fashion self to work! Learn the basic embroidery stitches. Use them to make a super cute greeting card. 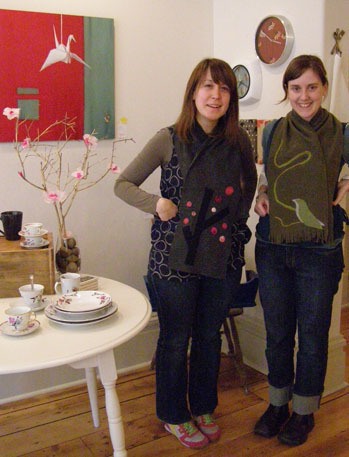 Take those skills home and try not to embroider every blank fabric or paper surface. Baby, your wardrobe needs a bib. Add a little zazazu to your holiday LBD (little black dress) with a you-made original necklace. Don’t adorn your door with the same supermarket generic wreath as all your neighbours. Come whip up a super sweet, crafty wreath for your abode. Draw, cut & print your way to simple printmaking. This skill will prove invaluable for making your own holiday cards, tags, wrapping paper, as well as some great personalized gifts. They all happen on a Friday night from 6-8pm. 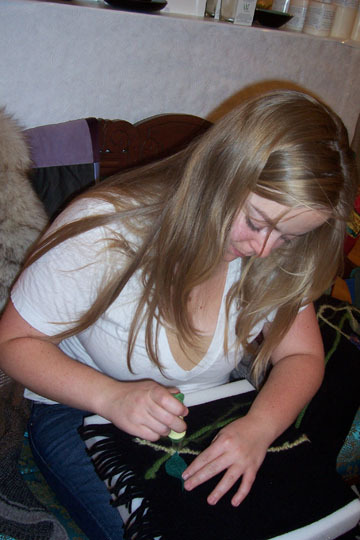 In every workshop you will learn a skill or DIY craft by making a take-home. You can then take those skills and ideas and craft your heart out at home. All workshops and DIYs were chosen to prepare you for the holidays. You will make things to adorn yourself, your home, and get you ahead of the game for gift giving. All Love, Me workshops are about having fun, making cool stuff, sharing skills, and meeting like-minded crafty folk. All workshops are to be paid for in advance by the end of the day before the workshop. 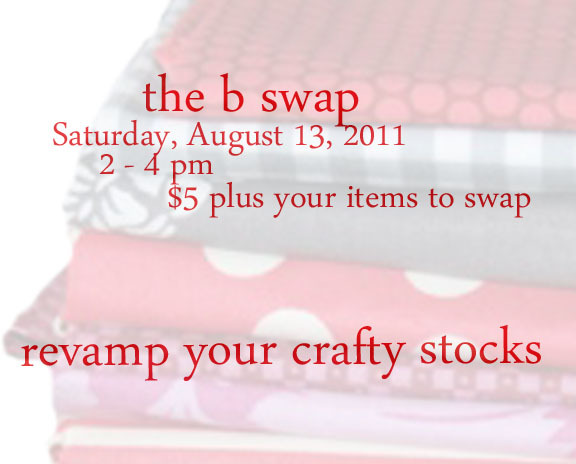 You may pay in person at the shop or by visiting Eventbrite. Four diverse painters teaching four different classes in a painting workshop series for beginners who are ready to move from desire to fire. Each one of our celebrated painters paints from a place of love and joy as well as having lots of techniques and skills. MAD SKILLZ YO! But this workshop series is not about the skills. This series is about working with 4 amazing artists who are ready to walk you through the process of blank white intimidation to colourful transformation with each artist utilizing a different focus/theme (citylife, still life, figurative). Artists: Kyle Jackson (September 16), Daina Deblette Scarola (September 23), Shelagh Duffett (September 30), Lindsay Hicks (October 7). 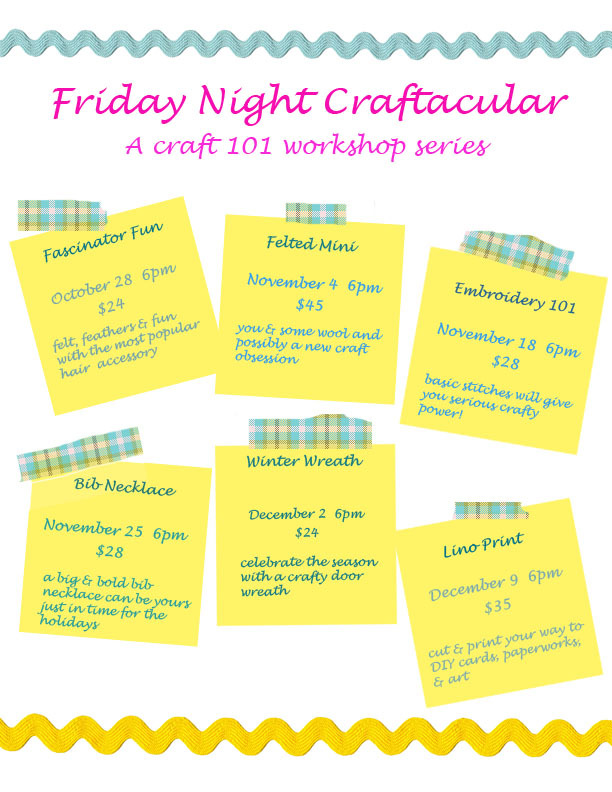 All workshops are Friday nights 6-8:30pm. Workshop space is limited. Registration is required. 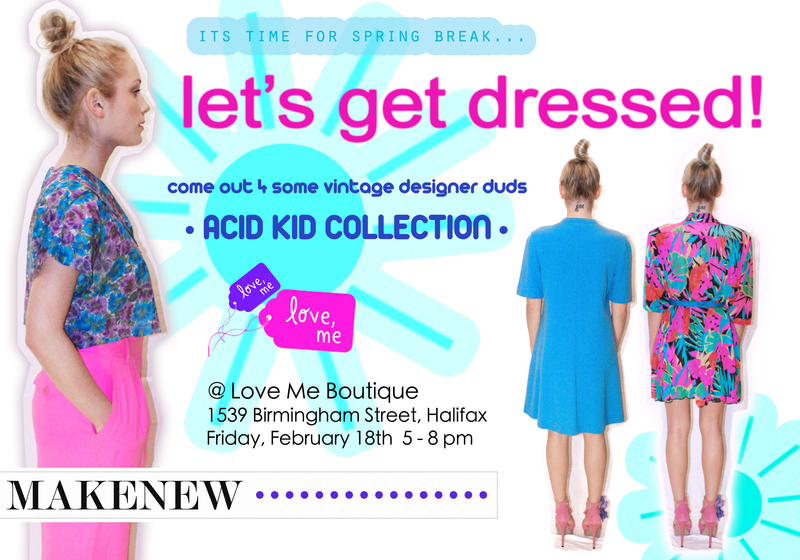 To avoid disappointment register on-line here or in person at Love, Me Boutique. Payment is required in advance. YOU love photography but you take the same photos over and over the same exact way. YOU love your camera but you never really take it out except the odd family function. YOU love meeting new like-minded people and having interesting experiences but you rarely step-out. YOU like yummy fresh sweetly packaged lunches. No buts. YOU are in need of a photographic adventure pronto! Saturday, September 17, join photographer/painter/blogger/creative Shelagh Duffett and some new friends for a group photo adventure through the Public Gardens and the Spring Garden Road areas finishing with a packaged lunch (included). Shake off the sleepiness of summer. Rev up your creative eye. Get out and see your city through a new lens. This adventure has a limited registration to provide a more intimate learning/sharing environment. To avoid disappointment, be sure not to delay in purchasing your ticket. Your can purchase them on-line here or in person at Love, Me Boutique. What exactly is a Photo Adventure? This photo adventure is a group of persons interested in exploring the city through a different lens. With a guide, photographer Shelagh Duffett, you explore a section of Halifax and take photos. Shelagh will lead you to photograph new things in new ways with verbal prompts, gentle suggestion and light guidance. This is NOT a technical photography or camera workshop. This is a guided exploration. This is an adventure. How long will the Photo Adventure last? The walk begins at Love, Me Boutique at 9am and continues until noonish . I say ish because let’s face it, when you get a gang together who are having fun and enjoying eachother’s company, well, you lose track of time. And while we will try to stay on schedule for those of you who have obligations, this adventure has no agenda other than to explore the city through the lens of our camera. What do I need? What is provided? 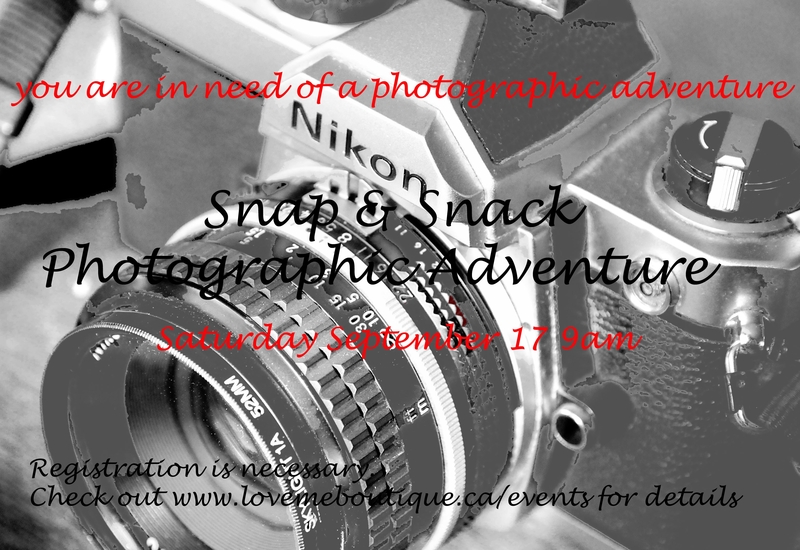 Your fee includes a fabulous photographic explorer, Shelagh Duffett, and a deliciously scrumptious boxed lunch provided by local chef and caterer Jenna of Little Red Kitsch’n. You will need to bring your super awesome self, a camera (digital is best but feel free to use film), a bag of sorts to carry your personal needs, your own water (suggested), your PROVIDED lunch box, and perhaps a small notebook. Yes. There is a maximum group size and we need a head count for lunches by Thursday, September 15th at noon. Sign up here. Or call / visit Love, Me Boutique in person and reserve your spot today. Why would I sign up for this when I could just take my camera and my own self for a walk? You could. You should. But isn’t it nice to have a guide when approaching new things or boning up on a favorite thing? Isn’t there always some new perspective you can learn from another brilliant creative person? And isn’t it lovely to be in the company of like-minded people having an adventure and meeting new friends? I also sent it on to Karen who lives in Rochester NY. I hope some day to visit your Mom and you too. The B Swap is right up my alley! I soooo hope I can make it. May be out of town on 13th…aaarrrgh. We hope to see you too Linda! A great way to freshen up stocks in time for fall/winter making.